The Place Du Grand Sablon used to be an undeveloped area in the past. In fact, in the 13th century it used to be a cemetery. In the fourteenth Century a chapel was built here, along with a miraculous statue of the Virgin, and the fortunes of this neighborhood transformed. Aristocracy moved in the sixteenth century and eventually the area became completely gentrified. The Fountain of Minerva was installed in the middle of the square in mid-eighteenth century. Everything from festivals to competitions to executions have been held here. Today it is one of the trendiest places in town to hang out. Antique stores, boutiques, hotels, restaurants, pastry shops, chocolatiers - these, and the beautiful architecture, make this one of city's most charming locations. Book-lovers should come here on Saturdays and Sundays for the Sablon Antiques and Books Market. More than 100 dealers set up shop here. 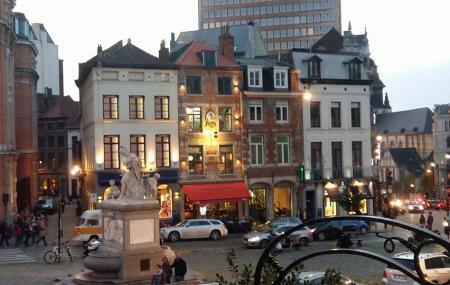 Also, visit the popular attractions in the city by following Brussels itinerary 3 days. Sunday 9 a.m. to 2 p.m.
How popular is Place Du Grand Sablon? People normally club together Notre Dame Du Sablon and Jardin Du Petit Sablon while planning their visit to Place Du Grand Sablon.